How will you meet your target growth rate? Have you been given an annual sales target to reach by the end of year? Today we launched a new tool for brand manufacturers to help reach their sales targets through accelerated growth on the digital shelf. Our Impact Assessment Tool lists the specific things you can do to meet your sales growth rate. To get started, simply choose the circumstance that matches your ecommerce business - online SKU count, retailer channels and revenue. The custom results are based on real data from Salsify’s customer base of thousands of brands, representing over 30 million products. Increase your online assortment by streamlining your content creation process, centralizing all product content you need and sending it to where shoppers can see it. 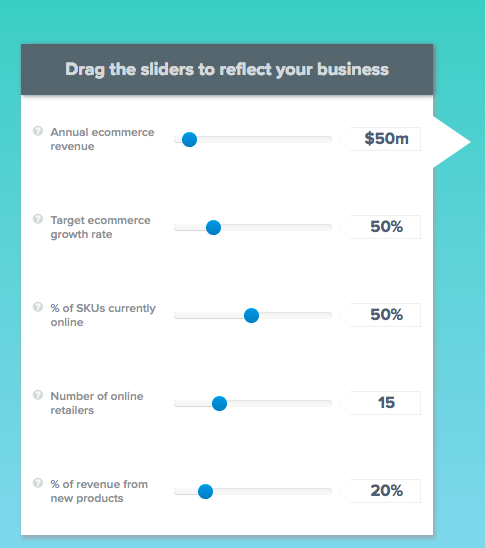 Sell on more online retailers by expanding into the Tier 2 and Tier 3 retailers in your category that you may have deprioritized in the past. Salsify has an extensive syndication capability and easily configurable digital catalogs, that can help you sell your products in a lot more places online. Improve your page conversion by updating product detail pages with high-quality content that inspires confidence in your customers and drive them towards the Buy button. We’ve helped customers achieve over 10% increase in conversion on Amazon through enhanced content. Outrank your competitors on the product search results page, by using Salsify’s Insights recommendations to uncover new SEO opportunities and see where you fall short of each retailer’s content best practices, then optimize your content using the readiness report to spot gaps and inconsistencies. Get to market faster by automating your data transformations and cut down on time-consuming back-and-forth with retailers. Salsify helps you quickly adapt your data to each retailer’s ever-changing content requirements and spots any errors before your content goes out the door. We built this tool to help you visualize a realistic growth trajectory, tailored to your business. It’s simply the first step in determining what ways your organization can meet its goals. Ultimately, the more you invest in building the best product experience for your consumers on the digital shelf, the more returns you will see.